Leak proof, positive on-off fitting that splits one line into three at the compressor. This small 2" long Moisture Trap (MT) unit rmoves water from the airline thus preventing moisture damage and inconvenience. Used in conjunction with the Paasche No.2 and No.17 Air Propellant cans to control the air volume from the can to the airbrush. The R-75 is an in-line low pressure regulator with a 60 p.s.i. gauge and moisture drain. This regulator gives user control of operating pressure as well as assisting in furnishing clean, dry and regulated air. Regulators must only be used as instructions and warnings specify. Five (5) micron filtration, 15 SCFM @ 50 p.s.i. CAUTION: R-75 is not for use on LCT Tanks. Always be ready to spray with extra batteries. Charge one while using another. Charge multiple batteries at the same time or keep a charger at multiple locations. Suitable for international travel. 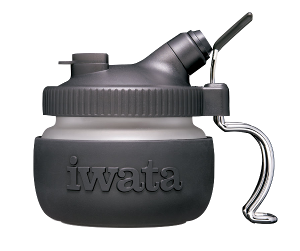 Holds your airbrush on the Iwata Freestyle Air upright or lying flat.